Doesn’t it seem like we don’t go a day without hearing about employee burnout — mostly what a problem it is? In a survey conducted last year by Morar Consulting, 95% of human resources professionals blamed the loss of good employees on job burnout. Headlines call it a “crisis.” Type the words “employee burnout” into the Google search bar, and one of the autocomplete phrases likely ends with, “is becoming a huge problem.” And yet, despite all the research pointing to how bad it is — for reasons ranging from physical health to how much employers lose on turnover because of it — it continues to be a huge problem. But what are you supposed to do about it? Many of us recognize these patterns in friends and family, but rarely ask that question of ourselves or, sometimes, our employees. So many people are afraid to take time for themselves until it’s too late and we reach — you guessed it — burnout status. That’s why I decided to enlist the help of an expert: HubSpot’s Manager of Culture and Experience, Tamara Lilian. I asked her about the many ways her team goes above and beyond to prevent employee burnout here — and, perhaps even more important, how employees and employers everywhere can put them into practice in their own environments. So, what did we learn? Read on to find out — or listen to our interview with Lilian by pressing “play” below. 1) Learn how to recognize signs of burnout. This tip applies more to individual managers than it does to employers as a whole. When workloads are at a peak for everyone, and there’s plenty of stress to go around, it can be difficult to remember to observe what — and how — others around us are doing. And when it comes to signs of burnout, it’s often difficult for people to recognize them even within themselves. That’s why it’s so important for managers to be able to recognize them — and take the necessary actions to address and resolve them. And while that can be tough for new managers, Lilian says, with some knowledge and information, it’s certainly not impossible. And while employees should also be encouraged to take time off when they need it, make sure they know that they should truly be offline during their times out of the office. For that reason, it’s fair to request as much advanced notice as necessary, so you can work together to make sure there’s a support system in place at the office that can allow that person to fully disconnect. 2) Set the tone with a company (or team) culture code. Here at HubSpot, we have a Culture Code, a document created to represent our people, culture, and values. It was written by CTO and Co-founder Dharmesh Shah with the mentality that, to build the best company, he would build it much like an engineer builds a product with code. Showing that you trust your employees can manifest itself in a number of ways, but a big one is to stop micromanaging. Autonomy is also a big part of our culture here at HubSpot — which means that while managers are encouraged to maintain strong communication and be available for help whenever it’s needed, they trust us to get our work done on time, ask for help when we need it, and keep them updated on projects. In other words, employees are given a large degree of control over their own work, which has been shown to correlate with both higher productivity and overall wellness. It also allows employees the freedom to independently discover the ways in which their work contributes to an organization’s overall success, which can lead to a greater willingness to ask questions — instead of being afraid of looking like they don’t know something. Being able to obtain that information without being judged for it can encourage creativity, too, as transparent, comprehensive answers can encourage new ideas. That said, as you begin to build your team, remember that perks don’t go unappreciated. Free coffee is great for most of us, let alone free beer. But also think about the things for which the novelty isn’t quite as likely to wear off — things like the engaging work that Lilian referred to. If your team isn’t producing quality work, don’t assume that it’s due to laziness. The issue could just be a lack of interest. Have a conversation with employees about that to find out what’s making them lose interest, and together, figure out how to make it more engaging. Riddle me this: If you never see your boss take a vacation, how good are you going to feel about taking one? Probably not great — you wouldn’t be mirroring the example set by your manager to never take time off. They say that actions speak louder than words, but this tip partially goes back to the idea of knowing when to recognize burnout. Don’t just take time off — encourage it, too. If you’re planning to take some time off and realize that it’s been a while since your employees have, bring that up in your next conversation. Even if that person responds that she’s too busy to take time off, discuss the importance of breaks and that you’re ready to work with her to make sure all bases are covered while she’s out. 4) Use the resources made available to you. And while we’re on the topic of the old “I don’t have time” excuse, when it comes to taking care of yourself, “you need to make the time,” says Lilian. 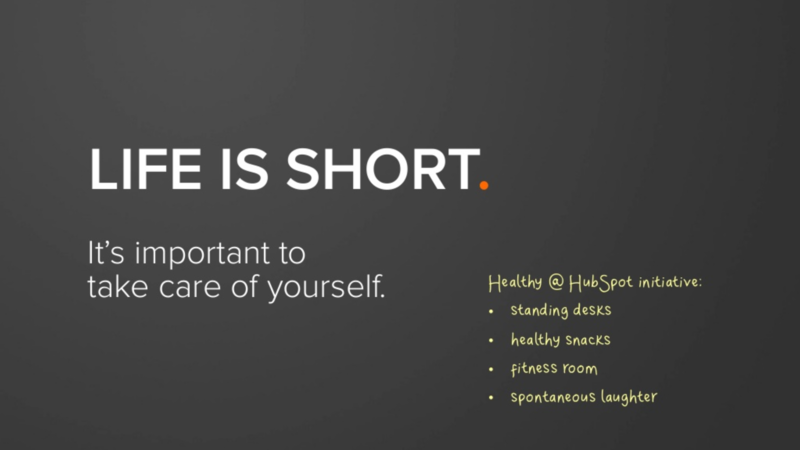 She points to the the Healthy@HubSpot program, which includes things like on-site fitness classes, a kitchen full of healthy snacks — including fresh fruit and vegetables — and standing desks. And while not every workplace will have the budget for these types of resources, it’s important to take advantage of those that are available. For example, maybe your workplace has a nice outdoor area. Weather permitting, don’t let it go to waste — eat lunch there, or sit there for five minutes when you’re feeling particularly stressed (more on that later). She also encourages making time to do these things with people who you don’t necessarily work with regularly. “Getting to know folks from other parts of the business can benefit the quality of your work,” she explains, by gaining more neutral and fresh insights or ideas. 5) Get away from your desk. In other words, when you’re starting to feel like you might lose it — whether it’s the result of a frustrating project or a co-worker’s annoying whistling — step away. Now. 6) Take the time you need — with good judgment. This practice falls along the lines of taking advantages of the resources made available to you. If you have paid time off — use it! According to Project: Time Off’s 2016 State of American Vacation, the use of paid vacation has been dwindling among U.S.employees since 2000. In fact, last year, 55% of them didn’t even use all of their vacation days, with an average of .2 days taken off per employee. Let your team know when you’ll be out of the office as far in advance as possible. My colleague, Sophia Bernazzani, uses the rule of one week notice for every day that you’ll be out of the office — so if you’ll be off for ten business days, let your colleagues and manager know about it ten weeks before you leave. Be prepared to hustle before you leave in order to get ahead on the time you’ll be out. Not only will you be minimizing the amount of extra work your colleagues have to share in your absence, but also, you’ll (hopefully) be returning to that much less to catch up on when you return. Make sure which regularly-occurring tasks you’ll be out for. For example, let’s say you and a colleague take turns doing something each month, like compiling a monthly performance report. If you’re going to be away during the time when it’s normally your turn, work with a colleague to rearrange the schedule so that she doesn’t have to unexpectedly take it on. 7) Don’t check in during your time off — and don’t feel bad about it. The point of a vacation is to leave your stress behind, or at least to try your best to detach from it, so you can feel rested when you get back to work. Keeping that source of stress present during your time off is like going to the dentist with one cavity and leaving with four. It defeats the purpose of why you went there. So please — don’t come back to work with four cavities. Disconnect when you’re away, and get the rest you need. Remember, preventing job burnout requires efforts from both managers and employees. The latter can’t be afraid to ask for the things they need to be well and do the best work they can — but their supervisors also have to create an environment where it’s not discouraged. Start making some of these incremental changes, and you’ll be well on your way to your own healthy workplace. How does your team prevent job burnout? Let us know in the comments.